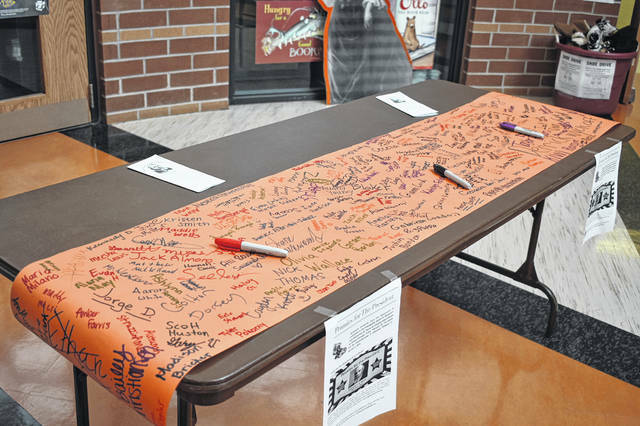 A scroll in the rotunda of Hayes High School that was signed by students during the Pennies for the President event. Hayes Principal Richard Stranges said the scrolls will be rolled up and placed inside the statue. 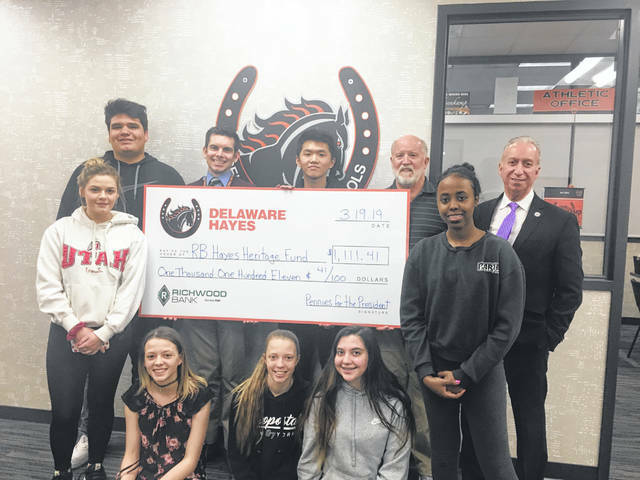 Hayes High School Principal Richard Stranges (top right) poses with Hayes staff and students after Richwood Bank’s Delaware Branch Manager Doug Wilson dropped off a check for $1,111.41 on Tuesday. Stranges said students from every school in Delaware collected the money in mostly pennies, and Richwood bank counted the donations for them and presented them with a check. Students throughout the city of Delaware recently collected more than $1,100 to donate toward a statue of Rutherford B. Hayes that will be erected in downtown this October. Rutherford B. Hayes High School Principal Richard Stranges said Wednesday that students were encouraged to give a cent toward the statue during an event he called “Pennies for the President.” Stranges said donations were collected at every school in the district as well as at Delaware Christian School and St. Mary School. Stranges said he had a goal of getting $500 and was shocked when students in Delaware donated $1,111.41. He said Richwood Bank then counted the donated pennies and presented them a check for the money. Stranges added he was thankful that Greif, Inc. agreed to match donations, essentially meaning students hit the $500 goal four times over. As for the Hayes statue, Stranges said the plan is for it to be placed at the southwest corner of the intersection of Sandusky Street and William Street on Oct. 4, the former president’s birthday. Stranges said the whole project will cost about $125,000 and has been in the works for years. During the “Pennies for the President” drive, students were also invited to sign scrolls that will be rolled up and placed inside the statue. Stranges added he’s also planning on having a bust of Hayes made for the rotunda of Hayes High School.